For a long time this was a pair of busy Little Chef restaurants, now they both have a new future serving snacks. 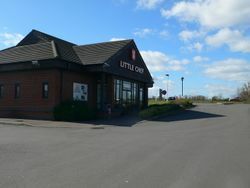 The Little Chef in 2009. 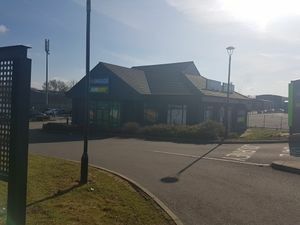 This was the last site to have two Little Chef restaurants operating in tandem, until they were broken up in 2017. The westbound Little ChefHistory opened in 1996 and the eastbound Little ChefHistory opened in 1998, the latter using a prefabricated building designed to allow the company to expand quickly, built on land cheaply available on the Kettering Bypass. The forecourt was already open so it was an easy place to build. In August 2009, the westbound Little Chef received a thorough refurbishment, and was one of three restaurants chosen to appear in the Channel 4 documentary 'Did Heston Change Little Chef?'. With trade increasing it was planned to gain a Burger King, but this didn't materialise. With Little Chef under new ownership, in June 2017 the eastbound restaurant closed, and the westbound restaurant closed a month later. Both were replaced by a more informal offering. BP Express operate the filling stations while Euro Garages continue to operate the restaurants. During late 2018, The eastbound Subway store closed. It is unknown whether the space will be replaced by another brand.